I've been waiting for the first snowfall to try China Glaze's There's Snow One Like You because then it would be a happy day instead of one that made me want to curl up in a ball with a bottle of wine and hibernate for the next six months sad. 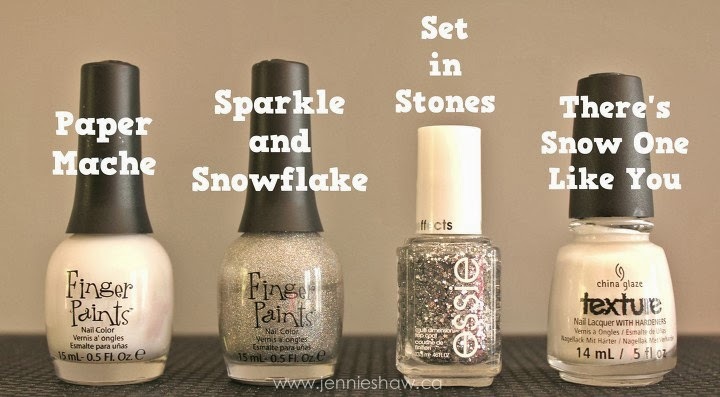 So, when I saw the first snowflake fall past my window, I went to my nail polish rack and started thinking about possible designs. I've read online that it can be tricky to work with, because of its texture, but because I do what I want, I decided not to heed those warnings. Haha! That makes me sound decidedly more badass than I really am (want proof, click here to see which Lord of the Rings Character I am). Side Note: Holy crazy-pants do things ever look different in natural light!! The plain fingers have two coats of Paper Mache and my middle has two coats of Sparkles and Snowflakes, followed by two coats of Set In Stones. For the pattern, I did two coats of Sparkles and Snowflakes and, when the polish was fully dry, used striping tape for the lines. Overtop, I did two quick coats of There's Snow One Like You and then peeled them off. Every finger got a coat of quick dry top coat as well. The extra-awesome thing is that There's Snow One Like You smells like snow-in-a-can! So funny! And at the end of the day, I didn't find it hard to work with. The texture is really cool, and I'm not usually one for textured polish, so that's saying something. I love that there are sparkles as well as hexagonal glitter. It's definitely a polish that I'll be using A LOT OF this holiday season! It's just so freaking fun!! OH MY GOSH this is SO gorgeous! I'm going to have to copy this. PRETTY!!!! oo la la! very pretty! This will be how I do my nails for New Years Eve. I've decided LOL. ERMERGERD Jennnnnnie, I love these!!! Your dual silver sparkles are beautiful and I love the way your criss-cross lines came out. Seriously flawless! And I'm sliiiiightly jealous that you've had snow already! This is fantastic! Essie's Set in Stones is my fav (and go to) silver glitter polish! And I think it's time I invested in some striping tape...I've seen many patterns I want to try but they require the tape. Aaaaand I'm totally stealing that ring-finger design idea. Even though I don't have There's Snow One Like You, and it looks AWESOME all raised and would look less awesome all flat. Because it rocks. Love it!! I think Snow One Like You seems like a fab polish, especially for nail art! I've never felt drawn to texture until now! I love your nails! Your designs are too cute as well. Thanks for hosting the link up and enjoy your evening.